Markus is a man of sophisticated tastes. His pleasures are considered scandalous in fact. So when the mysterious letters begin to arrive, telling him how the unknown E. has been following him about the streets of Georgian London, he is concerned. And as the letters get more explicit, aroused. 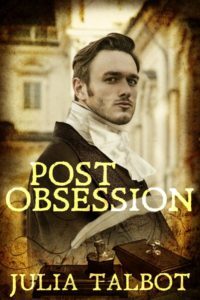 From clandestine meetings in the stews of the city, to the seemingly stolid world of the country, Post Obsessions follows the adventures Markus and his anonymous admirer as they play a dangerous game of cat and mouse that could lose Markus his place in society for good. This book has been previously published. The title and publisher may have changed.